In between 17th and 18th century era was known as modern history of India; in this duration There was very revolutionary changes in the social, political and the economic life of the country. For the same we are going to give some most important question and answers of following era. 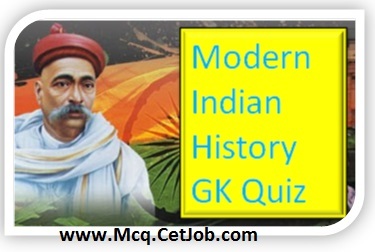 These Modern History GK questions are very useful for those candidates who want to prepare for the various government as well as private sector jobs; where the examiner asked such types of questions for the history knowledge. 1. Which of the following is not matched correctly? 2. Who said that “My ultimate aim is to wipe every tear from every eye”? 3. When was The Government of India Act 1858 passed by the Parliament of the United Kingdom? 4. Who was the supreme body in the Britain at the time of commencement of the Government of India Act- 1858? 5. Which of the following is not matched correctly? 6. As per government of India Act-1858, how many members were appointed to assist the Secretary of State for India? 7. After the commencement of the government of India Act-1858, what name was to British Governor-General of India? 8. Which of the following is Not matched correctly? 9.Who started the Indian Reforms Association? 10. Who was the monarch of Britain at the time of commencement of the Government of India Act, 1858? 11. Who led the Bardoli Satyagraha in 1928? 12. Which of the following trio leaders referred to as Lal, Bal and Pal during the freedom movement? 13. Why was the Khilafat Movement started? 14. Consider the following statement (s) related to the Nehru Report? I. It favored Dominion Status. II. It favored a federal system. III. It rejected the system of Communal Electorate. IV. It was against the setting up of a Supreme Court. Which of the above statement(s) is/are correct? 15. Where did Gandhiji form the Satyagarh Sabha? 16. Select the correct chronological sequence of the following events? I. Appointment of the Simon Commission. II. Formation of the first Labour Government in Britain. III. Submission of the Nehru report. 17. Which of the following leader organised the Swaraja Party? 18. Which of the following event was the reason for suspension of the Non-Cooperation Movement? 19. Which of the following incident ended the historic fast of Gandhi? 20. Which of the following is not correctly matched? 21. Who among the British Governor- General shown great interest in the preservation of ancient monuments? 22. Who among the following Indian cracks the British Indian Civil Services Examination in thr first time of Indian Histroy? 23. Who among the following was the counter part of Tipu Sultan during the Treaty of Seringapatnam? 25. Who was the Viceroy when the Jallianwala Bagh Massacre took place? 26. Which of the following British official associated with the local self-government? 27. Which of the following is correctly matched? 28. Which of the following Acts had provision of Indian Civil Services recruitment on the basis of competitive examination? 29. Who among the following Governors-General repealed the Vernacular Press Act of Lytton? 30. Which of the following Governor-General introduced the services of Railway and telegraph systems?